Troubled by peple who are to inquistive about what’s there on your phone ? Peep into your phone ? Or just take it from you and start reading your messages, mails and IM ? Well, we have a solution for you – BlackBook for your BlackBerry to keep such people at bay, so let’s find out if BlackBook’s worth an Install or Not. 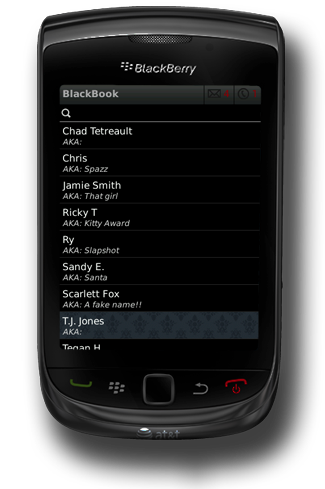 Keep your contacts, calls, and messages away from prying eyes with BlackBook’s hidden contact list. Sensitive contacts and conversations stay completely hidden on your handheld. It’s so discreet, there’s no icon to launch it. Simply type your custom launch-key on BlackBerrysmartphone’s keypad and your ‘BlackBook‘ appears. In short this app helps you keep your private life, private. Multitasking Capabilities: Works perfectly smooth with apps open in background, does not lag. The default launch-key for this app being five times end call key, shows in itself how seriously the issue of secrecy has been taken for this app’s design and functioning. Once you press the key five times, a black window opens up which looks as eerie and secretive as the name. The beauty of the app lies in the fact that it gives you the feeling of using something to hide information. The design suits the purpose and is perfect yet simple ! Follow few short steps to complete the transaction and installation from BlackBerryappworld, set appropriate permissions and your BlackBook is ready to go. BlackBook has simple menu with appropriate sized icons for options which makes it a user friendly interface. Using it is also easy, all you have to do is import a contact into BlackBook’s contacts and leave the rest on the app. What caught my attention was its ability to store info about a contact, which was more or less same as that of BlackBerry’s built-in contacts application. Filtering, call blocking works effectively without any lapses. Since this app does not have a launch icon, it gets inconvenient at times to type the combination key, if you are planning to use it regularly – but that’s the cost you have to pay for your privacy. Before exploring the app, if you go through the Help section, it’ll give you a fairly good idea of how to go about using the app to its maximum capabilities and unlike me you will know how stealth mode works in the first instance. Performance wise this app was better than most of the other apps of this type available from the appworld. Being hidden, it works in the background . Main question that arises here is its effect on processing speed. High-end BlackBerrys with OS 6.0 and 7.0 won’t have a problem as they have enough RAM to spare for this app. Although its not memory intensive, still it is bound to have an effect on processing speed of lower-end BlackBerrys. Thankfully, the bug which hindered auto call log deletion has now been fixed. Although Stealth mode cannot be applied to specific contacts from the app, it works fairly well. SMS and Email filtering is quite impressive and its unique way of notifying the user of incoming SMS and Email through a message box is amazing. It doesn’t need a BIS/BES account for its functioning except in cases where Email filtering is required. To make it more user friendly, the developer provides a “kill” option if in case the user feels like terminating the app, but then the only way to get it back up and running is by hard reboot that is by the famous battery pull method. The customizable combination-al launch-key looks after the security issues and thus helps in maintaining the user’s privacy. If a situation arises where the user forgets the launch-key sequence and wants to add/delete contacts from BlackBook, only way out is to delete the app and re-install it. That is an issue the user has to be careful about. On the whole the performance was very smooth and productive and takes care of my privacy concerns. Overall, this app looks promising and works fine but looking at the 3.99$ price tag, I think if the user can compromise a little bit here and there, he can get cheaper apps that are based on the same concept. Though, if privacy is really the primary aim for you – go get this app, you won’t regret it ! Reachability Cursor App, A blessing for users having tall Smartphones!